Playhouses are loved by both girls and boys. They imagine the playhouse as their very own castle where they could invite their friends to play and eat. Selection of colour is very important and has to be done carefully. Lighter shades should be preferred so that it looks lively and bright. If in case there is no electricity in the playhouse, darker shades would end up making the interiors of the playhouse dark even during the daytime. Selection of colours for the playhouse will also depend on the age and gender of your child. If it is a girl child, then you could go for colours in red, pink, purple and yellow whereas if it is a boy then you could prefer using combinations and shades of blue, black and white. 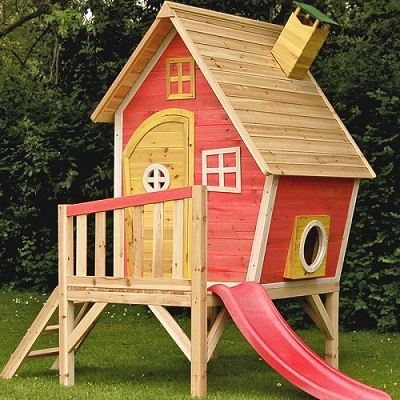 Bright colours make the playhouse vibrant and attractive. Use the exterior caulking tubes to seal the cracks around the doors and windows of the playhouse so that the rain water does not seep into the playhouse. After having sealed the cracks, use the sanders or a medium-grit sandpaper to smooth-en the exterior and interior surface of the playhouse. Also, rub around the edges so that they are smooth to touch.